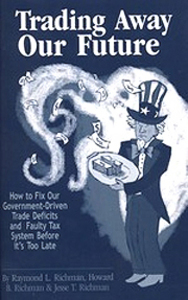 Trading Away Our Future: How to Fix Our Government-Driven Trade Deficits and Faulty Tax System Before it's Too Late by Raymond L. Richman, Howard B. Richman, & Jesse T. Richman, 229 pages, $12.95 paperback, published by Ideal Taxes Association, 2008. Special introductory price is just $9. Which, in effect, means that you get free shipping, since we charge a flat $3.95 for shipping of any size order. In this book the Richmans argue that the we in the United States are Trading Away Our Future and most economists have been caught with their heads in the sand. They think that the trade deficits are the result of free market forces. But the trade deficits are caused by foreign government currency manipulations and the foolish subsidies that the U.S. tax system gives to foreign savings. The American people know that something is wrong. They know that the Chinese and Japanese governments manipulate their currencies to steal American industries. They are intrigued by Governor Huckabee's endorsement of the FairTax, a proposal that would abolish the IRS, renew American investment, strengthen the dollar, and help solve the trade deficits. If nothing is done, then resolutely nondemocratic China will replace the United States as the world's premier power. In this book the Richmans explain solutions that are within our grasp. It is not yet too late.